Warmest congratulations to the newly inducted members of the National Junior Honor Society's St. Vincent's School chapter. 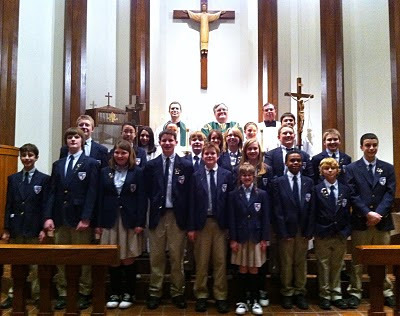 These seventh and eighth graders have demonstrated a zeal for learning and a heart for service. May God continue to help them grow in both! Thanks to Ms. Fergus, Ms. Wren, Mr. Monk, Fr. Petta and all those who helped make this a lovely Induction Eucharist.